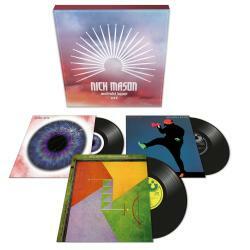 In just ten day's time (August 31st), Nick Mason's 'Unattended Luggage', a three album CD or vinyl box set of his albums 'Nick Mason's Fictitious Sports', 'Profiles' and 'White of the Eye' is released by Warner Music. These limited edition box sets will be available shortly before his acclaimed new band Nick Mason's Saucerful Of Secrets begin their European tour at Cirkus in Stockholm on September 2nd. For those who need reminding, 'Fictitious Sports' was Nick's debut solo album from 1981, which included collaborations with a variety of different musicians including Robert Wyatt and Carla Bley. 1985's 'Profiles' saw him hook up with 10cc guitarist Rick Fenn, and is a mainly instrumental album except for tracks Lie for a Lie which features vocals from Maggie Reilly and Floyd bandmate David Gilmour and Israel, sung by UFO keyboardist Danny Peyronel. Finally, there's 'White of the Eye', another collaboration with Rick Fenn, a soundtrack for the British thriller movie of the same name. Originally released on January 1st 1987 on Harvest in the UK, and Columbia in the US, to coincide with the film's release, this is the first time the record has been made available for over 20 years, and the first time it will appear on CD. For those not after the physical, 3CD or 3LP box sets of 'Unattended Luggage', the albums will all be available to download and through streaming platforms. Below, we list dedicated ordering links for both box sets - CD and vinyl - using these links will give a small but vital contribution to the running costs of Brain Damage, without costing you a penny/cent extra, and we really appreciate it!